Risorgimento Resort - Vestas Hotels & Resorts Lecce, Hotel Italy. Limited Time Offer! Risorgimento Resort. 5-star residence "Risorgimento Resort is popular among gourmets in particular. It is a perfect place to stay when exploring Lecce. This hotel boasts a total of 47 bedrooms. All the rooms have been described as roomy and modern. 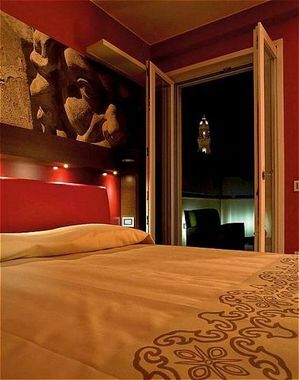 The soundproof and air conditioned rooms are perfect for relaxing without being disturbed by noises or hot temperatures. You can take a swim since this accommodation offers its guests the luxury of a swimming pool. There's no way you'll get bored as the hotel offers many recreational activities, like helicopter/airplane tours, fishing, mini-golf and birdwatching, as well as yoga, sailing, horse riding, golf, waterskiing, surfing, volleyball, aerobics, diving and tennis. Furthermore, "Risorgimento Resort" hosts a walking trail and gym as well as a bike rental service. The spa, whirlpool bath, sauna and hamam will help you feel reborn. The relaxation center also offers relaxing massages. Visitors will appreciate the Italian specialty of the onsite restaurant. For a drink in company, you will find the lounge bar most welcoming. To add to your stay, there is a continental breakfast in the morning. Internet access and an airport shuttle service are available.